Notes from a tour of the Unity/Tektoniks factory — Vermont Architect. One of my architect friends from Maine, Emily Mottram of Mottram Architecture said she was visiting the Bensonwood/Unity factory in Keene with current clients and their builder. I have been meaning to get over there and take the tour so this seemed like a good opportunity to tag along. The Unity series of homes are nice but not really my cup of tea aesthetically. Over the past few years I have spoken with many potential clients who seemed to feel the same so I have decided that they really are not my competition especially as I become more selective about taking on new projects. But as I do more non-local work and especially in regards to my growing Vermont Simple House portfolio of high performance house plans, I have been thinking I really need to dig further into what they are doing over there in Keene which is only a ½ hour drive from my office. That’s not for everyone though and at the same time the more conservative and traditional aesthetic of the Vermont Simple House series really resonates with so many people but I have done little to promote it other than set up a basic website. I’m am intrigued and excited about this part of my business as well and I see a large market potential. There are a number of other folks interested in collaborating on the idea of selling high performance home plans with some level of service as well as allied professionals who could become part of a larger business model than I alone am capable of. Perhaps working with Bensonwood is a way to address many of the weakness inherent in simply selling a set of house plans online. What follows is from a set of notes that I wrote up immediately after the factory tour and shared with Emily. Her replies are indented. January 24th visit to the Unity Homes factory in Keene, NH. 1. I’m struck by the sense of evolution on many levels from process, to materials to management to workflow. I get the sense both from what I saw as part of the tour and from talking to Ted Benson that there is a high level of openness to improvement and new ideas. I hope that doesn’t stagnate in the future. From Emily: This is the second time I’ve toured their factory and I was really struck by this as well. Last time Tedd gave us the tour and he mentioned (he’s European if you didn’t know) that they really looked into factories in Europe and how their dynamic worked. 2. I see this product/process as a way to get more qualified and professional people into the field of high performance home building. There is a continuing assumption that there is a separation between the blue collar and the white collar fields – a GC is no good if they haven’t swung a hammer on a crew for ten years type of thing. This notion has a relationship to the conundrum of getting women into this field. I think there is a growing niche waiting to be filled by small professional, social media, marketing and business savvy builders and a relationship with Unity could really fit that bill in many areas of the country. You don’t have to drive around in a big pickup truck full of tools and a large dog to be a builder. Again, they had this sense in Europe where age and gender made no difference. I think it’s part of the reason why he was so excited to work with Patrice and myself because we don’t allow gender to tell us we can’t build. But I agree, there is this cool little niche that I think could really catch on. Our lead framer has done commercial, residential and panel construction and he was totally excited about doing this. Just the right mindset. And I think the energy part is the hardest hurdle, so I think you could get some of your more progressive builders into it. Instead of building 1 house for 12 months, maybe they build 4 in 12 months – and they can still get behind the science and how it goes together, but without re-inventing the wheel every time. 3. As an outside architect, I never had the sense of how this all could apply to me. I think the marketing to architects is less than successful. Perhaps there should be an educational portal – process for design professionals – I would love to sit down with folks from Unity/Bensonwood one on one and see what they can offer me as an architect and what the process is currently like. Builders as well – In speaking with my colleagues on the building end of things, they are relatively unaware of how they might fit in. As an architect, If I bring up modular or pre-fab early in a conversation, I am usually shut down in no uncertain terms by the builder. (builders love framing and working out the insulation and air sealing details) (also, I’m not supposed to say pre-fab or modular) As an architect I realize that I need to engage and deal with these options. My prime responsibility is always to the client before the builder. But ideally, both and often they are one in the same. Modular and Pre-fab are like bad words. But they don’t have to be. I’ve had to explain the difference to my clients too. But I designed the house that is currently being built long before we ever decided to have Bensonwood build it. And there were virtually no changes that were made to my design in order to fit it into their panelized system. However, this house does not have really tall double height sections. Although it has some complicated geometry, slab areas, floor areas, walk out basements etc. Because I’ve worked with panelization before and I know what can go over the road, maybe I had that in mind. They can build anything on the Bensonwood side. But the custom designs by architects coming out of the Unity factory will have some panel constraints so that it still fits within the system. It would be well worth sitting down and having some training sessions on how it works. 4. The biggest opportunity I see may be to push my own VermontSimpleHouse.com plans toward a relationship with Unity. I often field calls from prospective purchasers of my plans whose biggest question is “How can I find a qualified builder?” I should need to sit down with someone at unity and a few sets of my plans to learn about how I could modify current and design upcoming houses to fit within the Unity factory parameters, and what the process would be. There is a tremendous amount of marketing potential there. I think this would work best through their Tektoniks division. I think VSH would be perfect for this. 5. I am interested in a further discussion about the different levels of product they can provide. For instance, can I coordinate specific windows or are there limited options there? I think I see in the literature, various levels of service. I often use local wood for siding and flooring for instance – part of my push for a hyper-local product (and process). Being only a 40 minute drive from the factory certainly helps. You can, they have a couple different options. 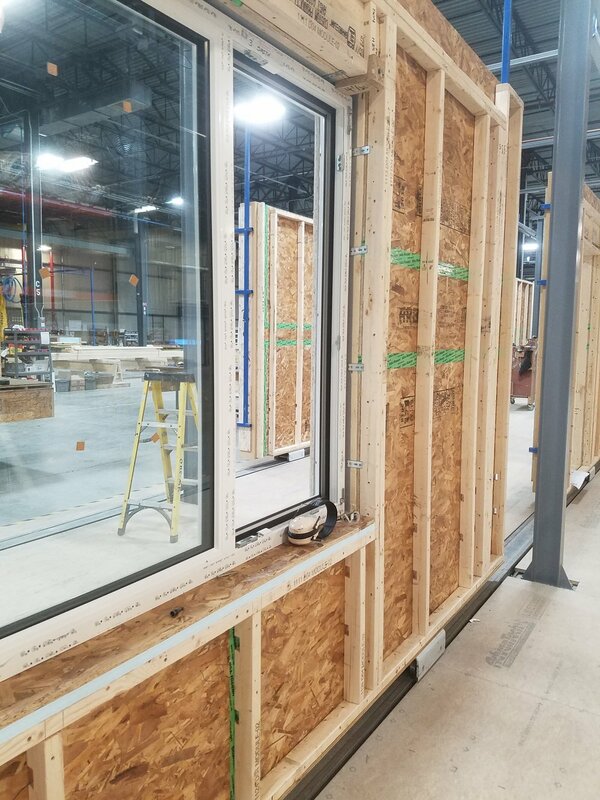 They prefer Wasco – and I don’t know the exact reason but I think it could likely be that they have an R&D team that probably evaluated installation, performance, availability, and durability of a series of different windows to get to where they are. They would have put Marvin’s in for me, and they have a series of different wall systems to varying degrees of efficiencies. But the difference between their OB wall (R-21ish) to the WFB6 R-26 – 36 was only $3000 – so it seemed like a no brainer. 6. Talking with Ted was a nice bonus. I tend to get overenthusiastic with an overwhelming amount of ideas but I am only one person and get easily overwhelmed by myself. I think Ted is a bit like that too but has managed to surround himself with like-minded people to get things done over the years. He has enthusiasm. Residential Design Magazine recently covered a projects that were built by the Tektoniks division of the Bensonwood/Unity factory. Every piece is cut by machine in the correct order for assembly and stamped according to where it goes. note alignment marks.